These are the notes for GoZync 3. Docs for the latest version of GoZync--GoZync 4--can be found here. GoZync 4 is a free upgrade and is highly recommended (hint: it's faster). What is the latest version of GoZync? The latest version of the GoZync framework is 3.173 (April 30, 2013). This build makes testing your integration a bit easier by aborting the pull of record IDs if you're unable to place attachments the inbox. There are only two scripts to replace so we recommend this for all users of 3.172, but it isn't a mod you need to deploy to your users right away. Then edit the field Interface::GoZyncCodeBase in GoZyncHosted and change the build number to 3.172. Distribute new version of your mobile files and you're all done. Build 3.171 (February 27, 2013). We've added a number of refinements to make testing and logging easier and fixed a few edge case bugs. We recommend this for all users of 3.17 and instructions for applying these changes to your files can be found here. Build 3.17 (December 18, 2012) This build adds one new feature to GoZync: it lets you pass up from mobile a set of name/value pairs that can be used when filtering records to pull down to your device. Previously we generally used the logged in Account Name in GoZyncHosted to know who was syncing and filter the found set for them accordingly. That still works great (and is very secure) if all you need to know is *who* is syncing. This feature is more for situations when a user may get to select which records they want to sync. For example they may ask to see records from a date range, or appointments for a geographic region they may be visiting tomorrow. These criteria can now be easily passed up to GoZyncHosted and used in your modifications of the "Filter Records to Zync" script there. Instructions on how to take advantage of this are here. We recommend this for all users of 3.16. Instructions for applying the changes to your file follow can be found here. Build 3.16 (November 21, 2012). With this version we've made a lot of changes to speed up syncs, squashed a few integration bugs, and made the integration process a little more hardy. Changes in 3.16 can be applied to your build by following the instructions here. We recommend this update for all users of 3.14 even if you're already up and running. Build 3.14 (September 25, 2012). This build fixed three bugs you may have run into if you were syncing related tables:: a bug in GoZyncHosted where we sometimes failed to pickup foreign keys; a problem where there would be errors if the layout and TO named didn't match; and an issue where we weren't getting related containers when FLM was off. All three bugs are fixed by changing scripts in GoZyncHosted. Instructions for making the changes can be found here. Build 3.13 (August 22, 2012). This build fixed another issue in the "Zync It - This File" API where we were using the first specified action for all tables in the file. To fix this in your copy, take a look at this screen shot. 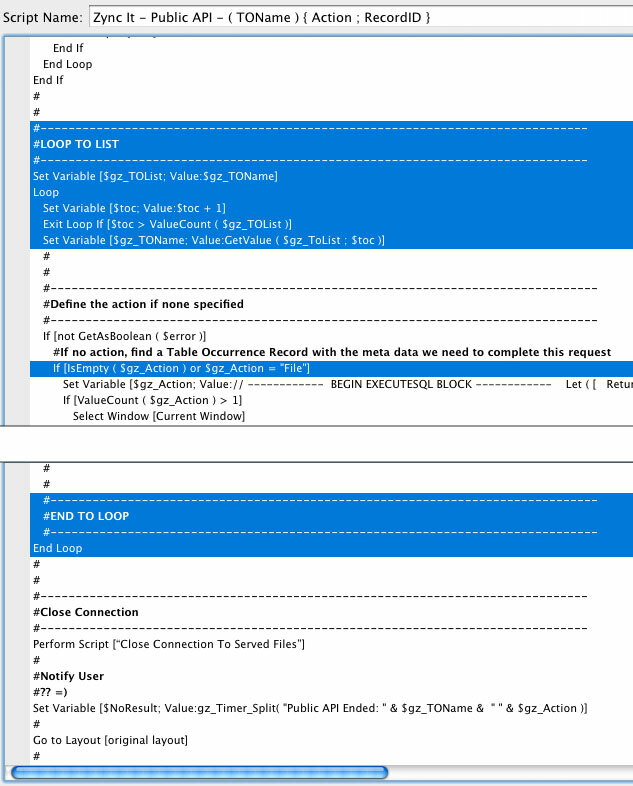 Edit that script in GoZyncMobile and add the first line shown in blue; then edit the second blue line to use the new variable name. That's it. 1. 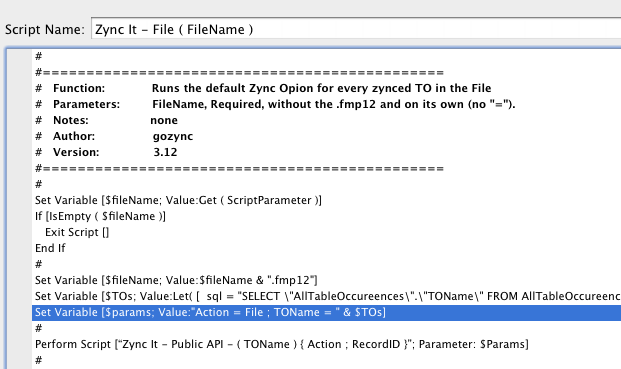 Edit the script "Zync It - File (FileName)" and change the line shown in blue here. 2. 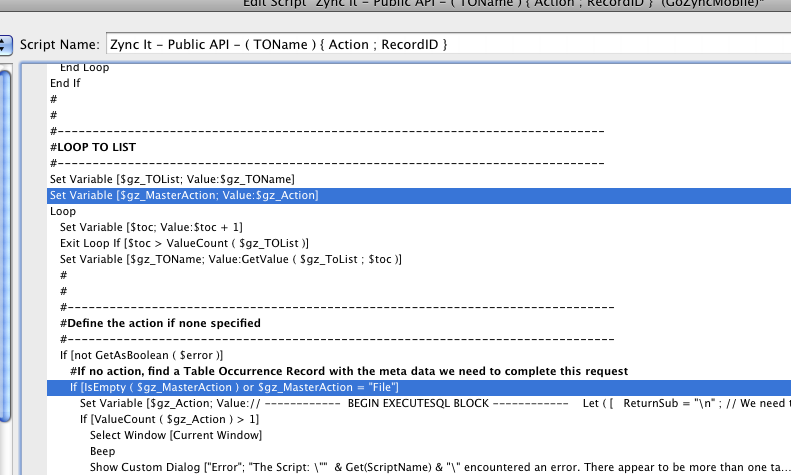 Edit the script "Zync It - Public API..." and add the first block of blue lines shown here. Then edit the single line next shown in blue, before adding the End Loop line shown near the end of the script. To get the latest build, please download the GoZync files from seedcode.com/downloads and, if you're using MoZync or ProZync, enter your license number. Build 3.1 (July 21, 2012). Released right after DevCon 2012 this version fixes a couple of broken documentation links, an oversight in one of our transaction scripts, and a bug where the admin password couldn't be changed in GoZyncLicense. Build 3.0 (July 13, 2012). Our first public build of the new version for FM12. Previous builds of GoZync can be found here.